Blue Majik® is 100% guaranteed. Suggested serving varies, please refer to your product label. 2 capsules, 1-2 times per day. Learn more about: detox processes. 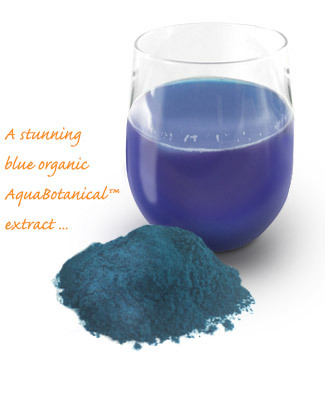 Blue Majik Fine Powder is derived from the highest quality, Organic raw material. Perfect for your beverage or raw food creation. 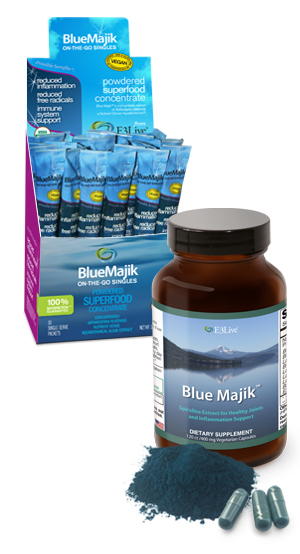 Blue Majik is available in vegetarian (no gelatin) capsules and powder—and now in prepackaged On-The-Go singles. A proprietary extract of Arthrospira platensis (Spirulina). Capsules are vegetarian capsules (plant cellulose and water). 1.) Once cashews have soaked for at least 4 hours, or overnight in the refrigerator, drain and rinse well. 2.) Blend all ingredients in high-speed blender for 1-2 minutes until well blended. Store in refrigerator in airtight bottle or mason jar. Mylk will keep for 3-4 days. Blend all except the chia seeds in a high-speed blender, transfer to a bowl or glass jar then stir in chia seeds. Let the pudding sit overnight in the refrigerator to thicken, stir periodically. Top with fresh blueberries and serve. method: Blend all ingredients together and in a high speed blender and serve. * To make almond & brazil nut milk place a 1/3 cup mix of almonds and brazil nuts into a high speed blender with 1 cup of water and blend. Strain through a nut milk bag or strainer. ** For frozen bananas - peel them and place in a ziplock bag overnight. Super attentive company to your needs. I currently use Blue Majik to support healthy joints. It’s night and day on the days I may miss a dose. Personally, I like the powder form. It allows me to have fun with my favorite color within my almost daily smoothies, chia pudding or over-night oats I make. Days I am lazy.. cup of vanilla coconut yogurt and 2 scoops of the blue with chia seeds. Just simply the best out there! I love this Blue Majik. I put just a small amount in my water bottles with lemon and drink it through out the day. A little goes a long way. It is very energizing and I feel a general sense of well being. The color is so healing! This is a wonderful product! This product has changed how I am able to function inn the world. I was born with an extreme autoimmune disease that has landed me in the hospital up to five times a year. Blue Majik has given me the hard hitting tool I needed to turn things around. Controlling my inflammation has kept me out of the ICU and able to go out with friends again. Thank you for this quality product. My body was suffering from the affects of extreme snowboarding and rock climbing... I had stiffness and inflammation in my knees and ankles so bad that you could actually see the swelling! I was so tired of waking up with sore ribs and an achy back. I didn't want to give up my active lifestyle, but I was at the point where I couldn't go a day without pain somewhere on my body. I started taking the Blue Majik because I know the harmfulness associated with pain medication, (whether over-the-counter or prescription) and I wanted to try a new approach. The Blue Majik not only took care of my stiffness, but I no longer have headaches and I sleep more peaceful than ever. I moved to a new house and accidentally packed up my capsules. It wasn't long before I started tossing and turning at night, experiencing those familiar pains again and pretty soon, had a migraine that wouldn't even let me get out of bed. A lightbulb clicked in my head, and I realized I HAVEN'T BEEN TAKING MY BLUE MAJIK!! Of coarse I unpacked them right away. Since that day, my symptoms have dissipated. I don't want to go through the pain that I was in ever again, and I know I won't have to as long as I have my Blue Majik! Take it from me... this stuff works! My Husband is a recent survivor of [a very serious medical condition]. Sometimes the nerve pain was so great in his abdomen that he didn't want to eat. After one week of 2 Blue Majik once a day the nerve pain vanished and has not returned. I am so grateful for this product. Are E3Live products Gluten Free? 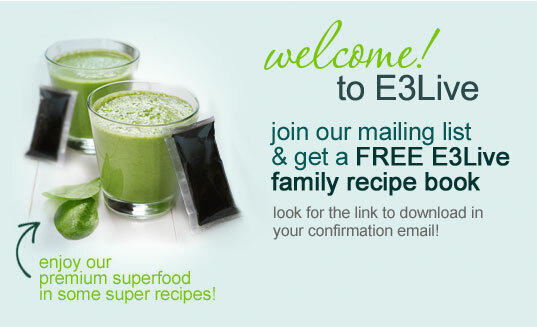 Can pregnant or nursing mothers use E3Live Products? We recommend that pregnant or nursing women consult with their medical or healthcare practitioner before using our E3 Products. How is the consistent quality of E3 products assured? From the moment we harvest the AFA, to its final packaging, we work with only the most highly trained and qualified staff. We handle our AFA with such care from start to finish. Factors contributing to this quality include: where and how we harvest, keeping the AFA cold at all times, superior filtration and storage, and ongoing quality-control testing of all of our products. All E3 products are tested thoroughly by independent USDA certified labs for food safety, shelf-life and various other purity tests. For more information please see our Purity page. I want to take other E3 dry products, should I keep taking E3Live/E3AFA? Yes. E3AFA and our signature product E3Live are valuable sources of nutrients with multiple health giving and sustaining properties.